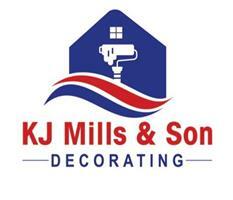 KJ Mills & Son Decorating - Painter/Decorator based in Isleworth, Middlesex. We are KJ Mills & Son Decorating. We are 3rd and 2nd generation decorators (you could say our veins run white with paint!) since the late Reginald Mills 1925-2015 the Mills family have been delivering the finest painting and decorating work in the London and Surrey areas. A family run company that dates back to the 1950s, many of our clients have been using us for up to 35 years. Now days we are run by Reginald’s Son (Kevin Mills) and Grandson With a joint 40 years’ experience in delivering first class decorating. Clean, Friendly & Hardworking it’s the Mills way.